I am Saori, a profesional shodo artist. 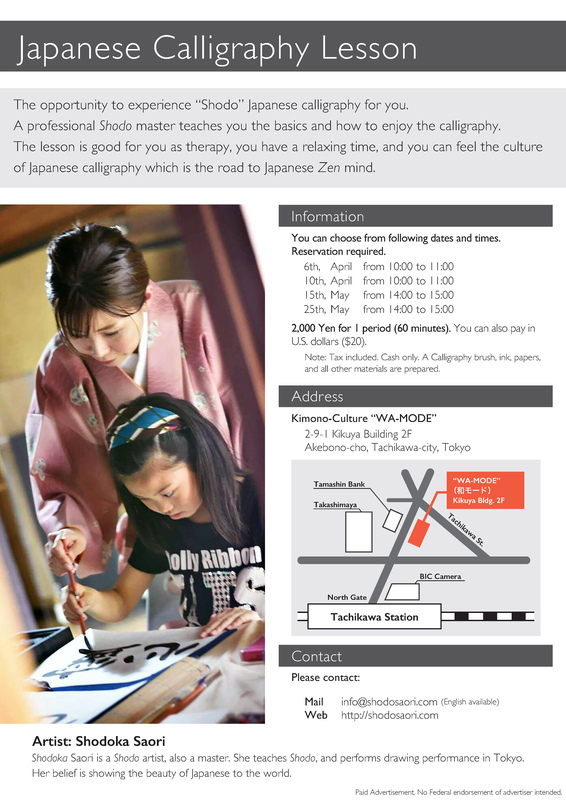 Shodoka is the Japanese word for calligrapher. As a performer, I call myself "Shodoka Saori". I aspire to show the beauty of Japanese calligraphy to people around the world. Although other calligraphers mainly draw Chinese characters,called "KANJI", I often use "HIRAGANA," which is of Japanese origin. This is because hiragana can express the delicacy of calligraphy. Sometimes,I powerfully draw a kanji on the wall with a huge brush, and sometimes I write it on a small piece of paper with small brushes. I would be very happy to have the opportunity to show you my performance. Practiced calligraphy and kendo during school days. 2005 Graduated from Sano College. Studied under Prof. Keiyo Hori. 2006 Achieved license to establish a Calligraphy school. 2013 “Saori” One-person Exhibition at Sano Chamber of Commerce. 2014 “Saori” One-person Exhibition for Commemoration of Sano City's 10-year Anniversary. 2015 Accepted for 4th Calligraphy Exhibition,in Saku,Nagano. First-ever calligraphy with music (harp) performance at Ashikaga Gakko Historic site. 2015 2016 Accepted for Dokuritsu Calligraphy Exhibition Tokyo. 2015 2016 Accepted for Mainichi Calligraphy Exhibition Tokyo. 2016 First-ever calligraphy with music (saxophone) performance at Tokyo Sky Tree. Calligraphy with music (piano and flute) performance at Ashikaga Gakko Historic site. © Copyright 2019. Shodoka Saori. All rights reserved.